In Japan, cooked sticky rice is pounded and kneaded to make a smooth mochi cake for eating. 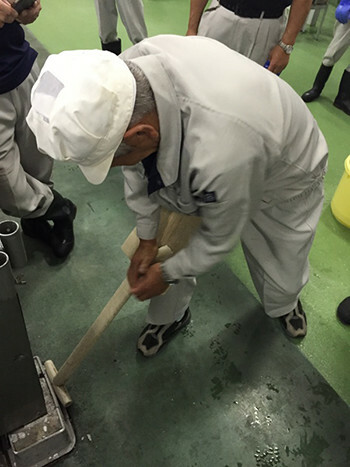 Sake brewers knead mushi-mai in a similar way to examine the consistency, and the result is called hineri mochi (a term specific to sake brewing). 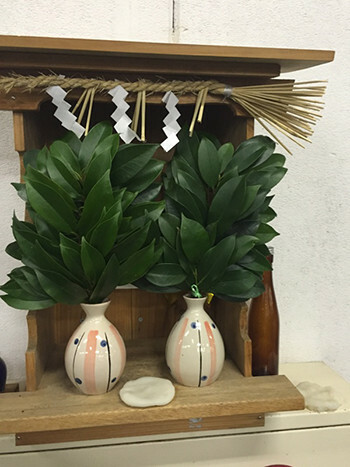 These rice cakes are made by taking a handful of steamed rice and kneading it flat into rice cake shape on the blade of the wooden shovel-like brewer’s tool called a bunji (used to remove the steamed rice from the steamer). While kneading, the worker checks the steamed rice for hardness, elasticity, stretchiness and the feel to the touch. It is then held up to the light to check the translucency, and the smell of the rice is also examined. If the hineri mochi won’t stretch, or the grains of rice won’t squash properly so that opaque white spots are visible when held up to the light, the steamed rice is called “uncooked” (nama-mushi), and is held to have been insufficiently steamed. The worker in charge of rice steaming makes hineri mochi for the chief brewer (toji) to inspect, and this is known as kenjo (long “o”), written with the characters (検蒸) for inspection and steam.